Vitamin E is a lipid-soluble vitamin, and a major part of our immune system. Like a good friend, it neutralizes the negative effects of pollutants and harmful free radicals! From the numerous ads we see for cosmetics on TV and in print media, many of us know that vitamin E helps us look young by giving us strong, shiny hair and glowing skin. But, how many of us are aware of the deeper benefits? This helpful vitamin protects the cells of the heart, liver and eyes from free radical damage by neutralizing the effect of oxidation. Vitamin E helps prevent cataracts and other progressive eye diseases. It is also known to prevent dryness of the eyes, and helps promote healthy tear film function. So, how do you ensure ample supply of this potent antioxidant? There are, fortunately, loads of good food sources of Vitamin E.
By including these in your diet, you can look and feel healthy and young. For maintaining complete eye health and good vision, Vitamin E must be combined with foods rich in protein, iron and zinc in your diet. 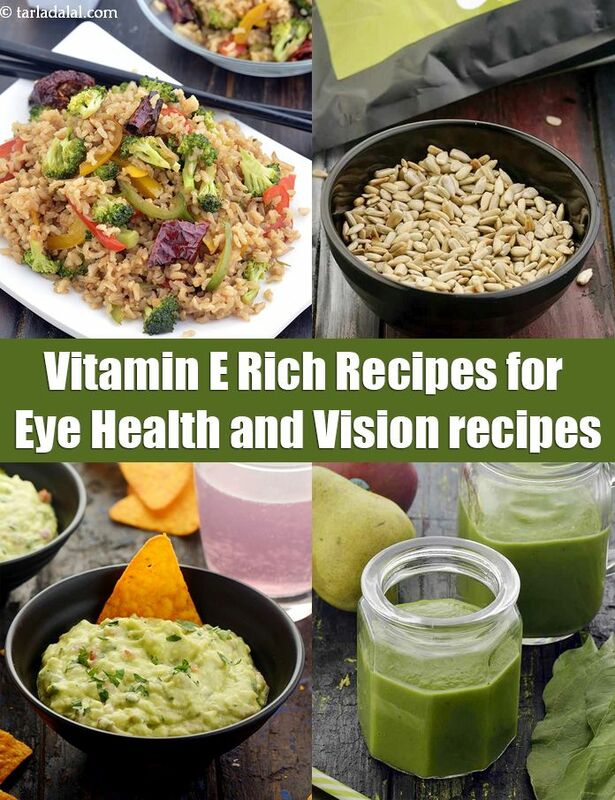 We have made your job simpler by suggesting mouth-watering Vitamin E rich recipes for eyes, which will help you maintain good vision and eye health. If you like the Vitamin E Rich Recipes for Eyes article, then you will like the other articles of Vitamin E.
The protein-packed paneer and spinach soup is a meal in a bowl! generous use of moong dal, paneer and spinach make it extremely nourishing and filling, while the onion and pepper bring in their soothing yet sharp flavours. Soup, with a lovely taste and consistency. This soup is brimful of the goodness of spinach and spring onion greens, not to forget a dash of coriander and mint. The nutmeg and black pepper not only spike up the flavour, they also bring in their healing properties—making this a true herbal delight. Almond, an age-old brain food is here to do wonders for your child. It is rich in omega-3 fatty acids, protein and iron... nutrients that boost brain power. Make it often to keep your kids mentally agile! Spinach and carrot soup, a palak delicacy enriched with wheat germ to make up for the necessary vitamin a and e for healthy vision and glowing skin.